Scrumpy 13hh, over 20 years, Garrano mare. Scrumpy is a great children's pony. Excellent on the lead rein and out on rides. 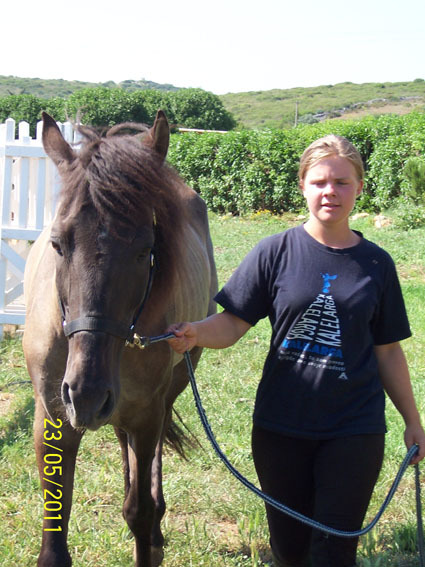 Now retired from competing in local gymkhanas, dressage and jumping competitions, she can still show you how it's done!. 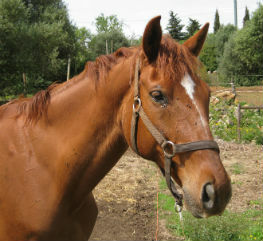 Xican 14hh, 10 years, Sorraia type mare. Xican joined us in late spring, 2011, and is proving to be an all-rounder. She is used for lead reins, in lessons and on rides out. Asia 15.2hh, 18years. 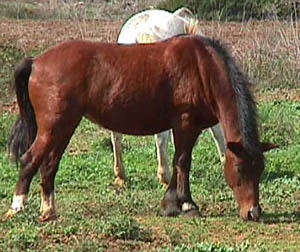 Lusitano Cross bred mare. 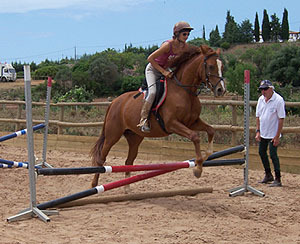 Asia is an easy to ride willing horse enjoyed by beginners and experienced riders alike. Turquesa 15.2hh, 11 years, Belgian Warmblood cross mare. 15.3hh 8 years. 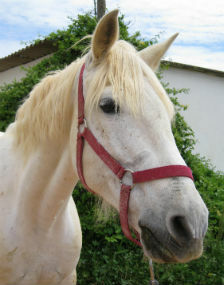 Lusitano cross mare. 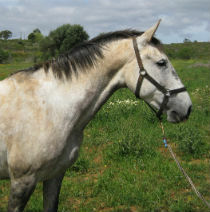 15.3hh, 11 years, Cruzado Portuguese gelding. Kendry 16.3hh, 10 years. Thoroughbred Cross gelding. Sonhar do Ferro . 16.1hh, 12 years, Cruzado Portuguese mare. Sonhar was born and bred here at Tiffany’s, by Dakar (Lusitano) out of Champagne Rose. 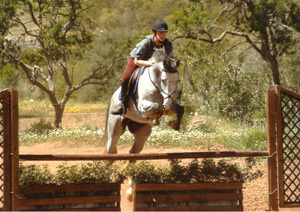 Trained by us, she goes out on rides and is used to teach initial jumping up to 90cms. Sonhar won the regional A.R.C. 4 year old Dressage championship in 2003 and the regional A.R.C. 5 year old championship in 2004.